Kathy Renwald’s recent feature article in the Star recounts the story of a Canadian couple who was unsatisfied with their garden even though it was filled with beautiful dogwood flowers and waterfall cascades that poured into a deep pool. Apparently one of them recently completed a yoga teacher-training course and determined their backyard was not ideal for yoga. Fortunately, their furniture design background allowed the couple to come up with a suitable deck design that was perfect for yoga. The couple browsed through several magazines and websites to gather deck design ideas, always keeping in mind that they wanted a deck that would complement their garden and not overshadow it. Unfortunately, unlike this creative couple, most homeowners don’t have such a highly developed eye for design and style. Less creative homeowners that want to convert their deck into a veritable haven for relaxation can turn to a knowledgeable and reliable deck company that boasts several years of experience in the deck construction industry. While the couple’s main intention of building a deck was to have additional space for yoga, the deck can also be converted to a venue for entertaining guests. Designing a multipurpose deck is likely to be a complicated and challenging project for the inexperienced individual. Thankfully, you can turn to dependable deck contractors like Archadeck to provide custom design solutions that allow you to use your deck as a workout area in the morning and as a party space in the evening. The couple knows that their newly built deck is a great investment in the future price of their home. 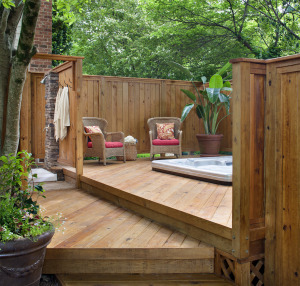 U.S. homeowners who plan to put their homes up for sale should follow the couple’s example and consider enlisting the services of deck builders to enhance the value of their own home. A beautifully designed and well-maintained deck will boost a home’s curb appeal and property value. On the other hand, a designer interviewed for the article emphasizes that it is not enough to simply have an aesthetically pleasing deck. Your deck must also be constructed with high-quality materials that enable easy maintenance. A good example would be pressure-treated wood that will withstand decay and bug infestation for a long time. For quality materials and design options, you can trust in companies like Archadeck that maintain a national supply network and close relations with high-quality manufacturers. With modern life becoming increasingly fast-paced, more and more people see the need to cultivate a more relaxed home environment. With the right design and materials, a beautiful wooden deck can serve as a soothing sanctuary from the hustle and bustle of everyday life. Ginger Klein’s August 6, 2013, article for the Colorado Gazette reports on the studies of Oxford University neuroscientist Russell Foster related to sunlight and its effects on the body. According to Foster’s study, sunlight can boost one’s mood, enhance productivity, and even regulate your body’s internal clock. Foster recommends daily exposure to sunlight to maintain good health. Regardless of such wonderful health benefits, every home needs to have adequate sunlight to make it feel warm and comforting. A poorly lit home simply looks dim and uninviting. It will also require much more artificial lighting to compensate for the lack of natural light. Nobody wants to live in a house that lacks visibility and comfort. Fortunately, the best way to introduce a whole lot of sunlight is by building a stylish sunroom addition. Foster’s study suggests that every person should get at least 1,000 lux, where “lux” stands for light intensity. To give you some perspective, you can get as much as 100,000 lux by being outdoors on a sunny day. On the other hand, being cooped up in an office building limits your sunlight exposure to only 300 lux. Foster stresses that artificial light is no substitute for real sunlight and that an insufficient amount of sunlight can be detrimental to one’s health. Homeowners that decide to install sunroom additions can look forward to getting healthy doses of natural sunlight every day from the comfort of their home. 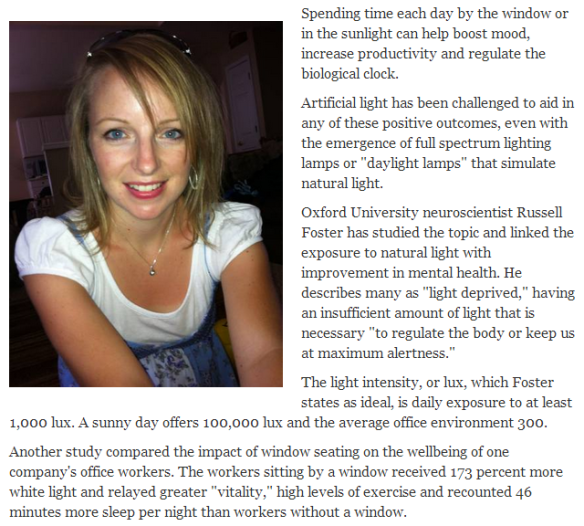 The same study explores the effects of sunlight on office employees. Apparently, workers seated next to windows reportedly had greater vitality and were capable of performing higher levels of exercise. They also enjoyed 46 minutes more of sleep per night than those seated away from office windows. To offset inadequate sunlight exposure indoors due to low lux levels, Foster recommends spending time outside in the sunlight for about 30 minutes each morning. If you would like to take advantage of the abundant sunlight surrounding your home in optimum comfort, you may want to consider converting your porch or patio into a glass-enclosed sunroom. You can stay cozy inside, enjoy the outside view, while still getting enough sunshine to keep you healthy. 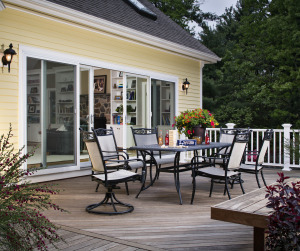 Count on trusted contractors like Archadeck Outdoor Living for the best sunroom designs guaranteed to make your home a favorite gathering place for family and friends. Sunlight is always a welcome element in any home, but who would have thought that it could also boost your health and productivity? 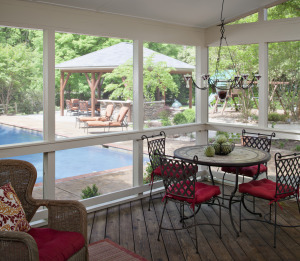 Go ahead and let some sunshine into your home by building a custom-designed sunroom that will allow you to bring the outdoors in. Discerning homeowners who wish to create more opportunities for entertainment and recreation see the value in extending their living spaces. For example, one can build a patio, porch, sunroom, or deck, depending on the prevailing terrain and one’s personal preferences. When constructed properly, these outdoor living spaces will not only enhance curb appeal, but they will also boost property resale value. Some homeowners may not be sure which sort of structural additions are best suited for their homes. Luckily, an article on News4Jax.com offers practical advice to anyone who is having a hard time deciding between a deck and a patio addition. To make a more informed choice, you should get acquainted with the essential patio or deck building principles and then contact a trusted contractor like Archadeck Outdoor Living to provide further advice on your project. 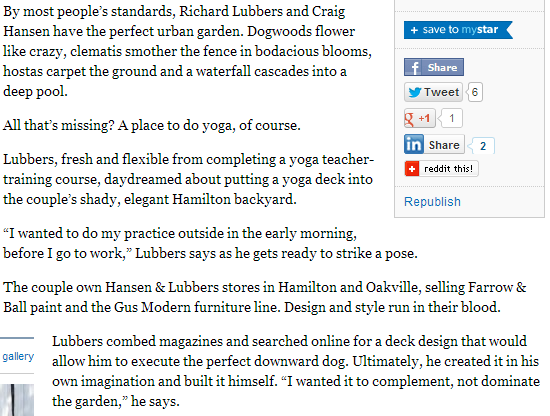 The article starts off by pointing out the main difference between patios and decks. Patios are built primarily at ground level and can be made of concrete, pavers, stone, brick, or other suitable materials. On the other hand, decks are elevated structures attached to a home and usually constructed of wood or composite materials. The next big step you will need to make is determining your budget. Angie Hicks, founder of popular consumer reviews site Angie’s List, recommends determining how much square footage you wish to add so you can have a clearer idea of the potential costs involved with each possible option. It is also advisable to consider all possible maintenance issues. For instance, wooden decks may be less expensive to install than composites, but they need to be sealed, stained, and fitted with new railings and floor planks from time to time. In addition to cost and maintenance issues, it is also important to consider the general landscape of your property. Patios are much more appropriate on flat rather than hilly terrain, while decks can be constructed on pretty much any property regardless of topography. You also need to assess your intended uses for any outdoor living space to determine if there are any safety or maintenance concerns. Deck safety considerations typically revolve around snow buildup and efficient drainage. Fortunately, you can count on established companies like Archadeck Outdoor Living to conduct deck and patio safety inspections as needed. By carrying out timely inspections and repairs, you can reduce slip and fall hazards that are typical on outdoor living spaces. To guarantee safe and durable outdoor structures, you will need to work with a reputable and competent contractor who has built a solid track record in the deck building industry. 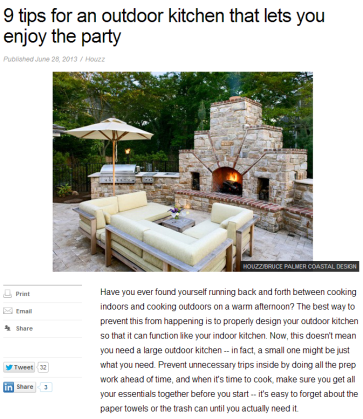 FoxNews.com provides helpful tips on how to effectively design an outdoor kitchen. Taking tips from popular website Houzz.com, this article focuses on how to arrange certain design elements to ensure optimum comfort and efficiency during and after food preparation. These tips include building the outdoor kitchen adjacent to the indoor kitchen, adding a bar top, and having comfortable and inviting furniture close by. 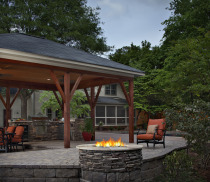 A well-designed outdoor kitchen can create memorable parties and prevent accidents that you wish you could forget. For families that love to dine and entertain, classy outdoor kitchens are the perfect home additions. Lisa Taylor of About.com defines an “outdoor kitchen” as a food prep area in an outdoor living space that is designed for a more informal and recreational dining. Food preparation in an outdoor kitchen is certainly not limited to barbecues, especially if this area is fully equipped. Space is one of the most important elements when it comes to designing an outdoor kitchen. The article recommends allocating enough space for food prep, cleaning, and serving to avoid any significant hassle or accident risks. It all comes down to ensuring safety and efficiency in regards to food preparation. Trusted companies like Archadeck can figure out the most suitable outdoor kitchen design to ensure a clutter-free space distribution that will facilitate movement and foot traffic. Another aspect that needs to be addressed is the ease with which the host can interact with guests while preparing food. The article suggests installing a bar top in an outdoor kitchen to allow the guests to sit, talk, and watch as the host is whipping up a sumptuous meal. The most suitable bar tops for outdoor kitchens consist of natural stone, ceramic tile, and wood. Larger outdoor kitchens with wide counters will allow guests to assist with all food preparation activities. Depending on the design, the counter may also serve as a bar top or a dining table after food preparation is finished. For the best outdoor kitchen designs that exemplify form and function, consumers can turn to reputable companies like Archadeck for advice and assistance. Keep in mind that although the Internet offers quite a number of fancy outdoor kitchen design ideas, very few place an emphasis on safety and efficiency. It is always beneficial to prioritize optimum use of space that will help minimize slip and fall incidents when you are picking out a design. Using a bit of creativity, an eye for design, and the help of a reputable contractor, you can soon have a dream outdoor kitchen that will turn your home into party central. amping has taken on a luxurious dimension in New York City where customers can book outdoor bedrooms complete with queen-size beds, flat screen TVs, and champagne in high-end locales. Deepti Hajela reports in an article published in lohud.com about the growing trend of “glamping” (glamour + camping) that allows people to camp on patios or terraces of luxury hotels and condos, while still receiving 5-star accommodations. The incredible experience comes at a high price tag, so it is not surprising that is mostly available to affluent clients. This kind of luxury service highlights how much a properly built patio can boost a property’s value. These days, patios, decks, and terraces are considered extensions of the home and are often referred to as outdoor rooms. With stylish patio designs, homeowners can enjoy the serenity of the outdoors right in their own backyard any time that they want. By having your own patio retreat, you can create your own version of glamping whenever you feel like it and you won’t have to pay the high accommodation rates. If you have an open space in your yard, it could be a good idea to convert it to a patio and style it to suit the function you want it to serve. A patio can be a great spot to hold barbecues with family and friends, lounge the day away on a lazy afternoon, or sleep under the stars on a clear summer night. Creating a patio oasis does not need to be expensive, especially when you are working with reputable patio builders that have the flexibility to build a patio within a wide range of budgets. Choosing the right contractor is an important step toward realizing the patio of your dreams. In addition to flexibility, it is important to find a patio contractor who has a track record of working within customers’ budgets and still coming up with beautiful, well-constructed patios. Some people believe they can save money by turning it into a do-it-yourself project. Most experts recommend that unless you have the necessary skills, experience, and equipment for the job, it will be more cost-efficient to hire professionals instead. Without the right know-how behind it, a DIY project can go wrong in so many ways. The cost to correct some mistakes may prove to be higher in the end. In building a patio, some of the most important things to consider are the available space in your property, the materials to be used for the patio, and the patio’s intended purpose. 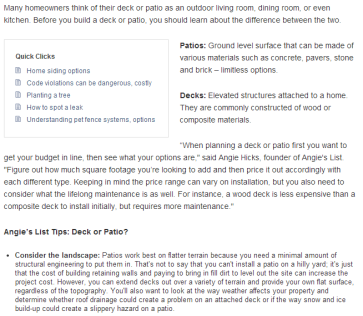 Highly experienced patio builders like Archadeck can help you with all these aspects. They will work closely with you right from the start so that your own design ideas and preferences are incorporated. If you are ready to create a glamping escapade right in your own backyard, it is time to contact a professional patio contractor who can help you achieve your goal. According to an Associated Press article published in The Washington Post, improving real estate market conditions are encouraging more people to remodel their homes. This observation is based on a report from the Joint Center for Housing Studies at Harvard University. It predicts that home improvement expenditures will jump by as much as 20% during the fourth quarter of 2013. The article also cautions homeowners to prioritize their remodeling projects carefully to avoid making costly mistakes. Unfortunately, not all remodeling projects are guaranteed to boost a property’s resale value. For example, home buyers who have young children may be against purchasing properties with swimming pools due to the safety risks that are involved. On the other hand, an editor for a home improvement magazine comments that a well-built deck is considered to be a “high-return item” for practically every home. Almost every person wants to hang out and spend some quality time with their loved ones on a beautiful deck. If you are interested in a brand-new deck that will strike an optimum balance between beauty and affordability, then contact a reliable deck builder like Archadeck for a free quote. A well-made and aesthetically pleasing wooden deck that has passed the scrutiny of home appraisers can yield an 85% return on investment (ROI) once the home is put up for sale. In contrast, a brand-new bathroom only allows the homeowner to recoup 78% of the initial investment. Home improvements that enhance curb appeal and resale value make more financial sense than costly finishes or appliances that will do nothing to improve a home’s marketability. People who are looking to sell their homes should avoid the temptation to “over-improve” and just focus on what additions or enhancements prospective buyers actually want. Unless you are a skilled handyman who has worked on a deck before, it would be best to pick experienced and reputable deck builders that can work within your budget without compromising quality. This way you can be sure it will be done right. Some companies like Archadeck will also provide consultation services that map out each deck construction project in detail. This shows the homeowner the suitability and ROI potential of the various materials they can use. It is also a good idea to consult with home appraisers who will determine whether a particular home improvement project is really worth pursuing. 2013 is a good time for homeowners to refurbish their properties with brand-new additions like wooden decks. It is always a good idea to carefully consider every remodeling decision with utmost care since even the most favorable economic conditions cannot shield you from the expensive of a poorly conceived home improvement project. At Archadeck, our goal is to create custom deck designs that work for our clients. That’s why every space is different. No two clients and homes are exactly alike, thus no two decks are the same. Our Archadeck of Suburban Boston location recently completed a job that is a great example of a multipurpose deck. Their clients wanted an enhanced outdoor living space that would be used in multiple ways. They wanted a space for an outdoor dining table and space for an outdoor living room. Additionally, they wanted an area for their hot tub and wanted it all open to the yard to account for their kids. Jim Finlay of Archadeck of Suburban Boston designed a deck that would span the width of the house with two distinct areas. On one side there is the entertaining space that has the outdoor living room furniture. Jim decided to incorporate the hot tub into this part of the deck. That way, people who are enjoying the hot tub can still talk with those that aren’t. To keep communication easy, the hot tub was not installed on the deck, but below. That way the people inside the hot tub are not above those that are outside of it, but right at eye level. On the other side of the space there is a large open area that has enough room for the outdoor dining room the family wanted. With a deck this large, defining the distinct areas of the space can be a concern. While there are numerous ways to achieve the goal, the Archadeck team used the decking boards to do it. Take a look at this image of the dining space. The boards were installed at an angle. Then you will see a board going straight out from the house. This is a subtle way to block of the “dining” space from the “living” space. To keep it open, the deck was designed without railings throughout the majority of the space. The deck is low-to-grade which means that it isn’t very high off the ground. 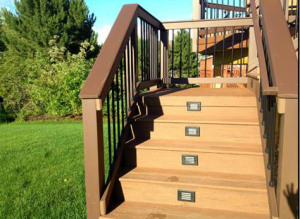 Low-to-grade patios and decks are not required to have railings by law. This is a great option for homeowners who want the space to be open to the yard and have a home that doesn’t need a raised deck. Built in benches do act as a railing in a few areas while providing additional seating. The picture to the right shows how open the space is with the lack of railings. People on the deck can see out in the yard and vice versa. On another note, how smart was the slide idea for the kids to get down from the raised yard? If you have questions on patio or deck design, please reach out to your local Archadeck office. Our deck contractors are sure to help answer all your questions.